The original inscription, B1367, was seared by a German soldier into the arm of the 10-year-old child Yeshayahu Folman in June 1944, on the day he was brought to Auschwitz. The boy had been sent alone from Piotrkow in Poland, and did not know what happened to his parents, whom he would find only after the war. 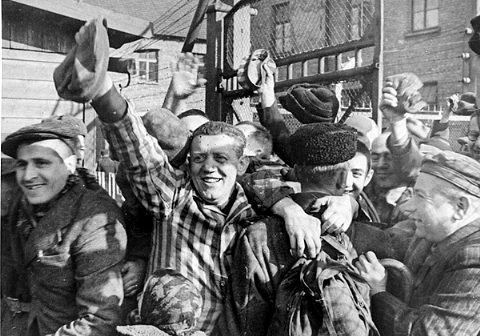 After surviving selektions and three years in the Blizhin and Treblinka camps, Folman - who describes himself "a survivor, like a field mouse" - survived Auschwitz as well. 10 year old boy arriving at Auschwitz in June 1944 and surviving the selection? 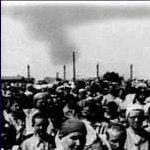 Are there any public statistics about Auschwitz survivors? This is the'holocaust' Industry shooting itself in the foot again. According to the storyline, children, the sick, and the elderly were immediately 'gassed'. And note that Yeshayahu Folman and his family 'survived' even though there was supposedly a 'plan of extermination for every Jew the Germans could get their hands on'. In fact there are hundreds of thousands that claim to be 'holocaust $urvivors'. Extermination, right. 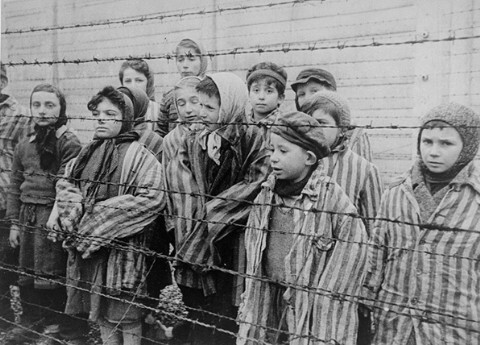 Healthy Jewish children alive in the Auschwitz II (Birkenau) upon Soviet arrival. Still from a postwar Soviet film. I've seen those photos but may be about inmates arrived after the alleged gassing program was ended. What about statistics?. Survivors in their claim$ must have said something about their age/year of arrival at Auschwitz. If we find a substantial number of boys under 13 that have arrived at A. between 1941 and sept 44 that survived afterall, that will expose the hoax once more! holowiz wrote: I've seen those photos but may be about inmates arrived after the alleged gassing program was ended. The alleged gassings supposedly continued until Oct/Nov. '44. Oops. There are endless examples at this forum where Jews, who should have been gassed, were not, if the storyline was true. The Arolsen archive would have plenty data in this regard, but curiously, only those who are 'approved' will gain access. Good day, M. Holowiz. You have made an excellent contribution with pointing out this news article, and providing yet another wrinkle in the 63 year story. It is odd that a 10-year old boy would be "selected" to serve some labor purpose, isn't it? Especially at a time when the Auschwitz camp is said to be gassing everything that moves or enters the camp, some 20,000 persons a day (according to F. Piper). I believe an equally good question would be: How would a 7/8/9 (depending on when shipped) year old boy survive the "selections" of Treblinka? Remember that at Treblinka, the only selections said to have went on were done to pick out laborers to remove and incinerate gassed corpses. Certainly we are not led to believe that a mere child was chosen for such a demanding task? A quick surf found that some 700 children were present at the camp for Soviet "liberation". I am not aware of any other widely available statistics. I imagine you would be forced to travel to Poland or Mocow for such information, if it even exists. Hannover wrote: This is the'holocaust' Industry shooting itself in the foot again. Sooner or later exterminationists will get around to circulating the fable that bored Natzee Guards were tattooing children for fun while awaiting gassing. Exterminationists had to resort to the ludicrous tale that the Auschwitz Brothel was only used by the guards, until it was pointed out that it was illegal for Germans to have intimate relations with Jews, whereupon they had to resort to claiming the "Brothel Workers" forced of course were non Jewish. The every changing storyline in the face of incontrovertible evidence. This site also claims Konrad Morgen was in fact "outwitted" by clever guards! This is just not adding up like most of the liars that appear with their own "story of survival". If one reads the article it suggests he spent 3 years in Treblinka and Blizhin before arriving at Auschwitz in 1944. That means he first entered the camp system as a 7 year old and "survived" at Treblinka, a camp from which less than 100 "survivors" are claimed by the holohoaxters. Which ever way you look at it this just does not add up, he claims he went through 2 so called "extermination" camps where the fairytale claims children were killed immediately and now wont show the world his untraceable tattoo number, phleease I wonder why not? Deborah Lipstadt unknowingly makes my point after commenting about a video recently featured on youtube. By the way, there was a swimming pool at Auschwitz 1 -- not Birkenau where most of the Jews were -- it was rarely used by inmates and its main purpose was to store water for fire fighting. No evidence, no supporting material, just a statement as if it were fact.